Are you ready for an eye-to-eye encounter? Have you ever killed a whitetail deer while bowhunting on the ground? If so, then you understand the voltage-like effects it has on your sensory neurons. Why is it such a rush? Well, because every single move or twitch you make must be executed at precisely the correct time, or you’ll get pegged and lose the shot opportunity. Staring your prey in the eyes adds unequivocal pressure to an already adrenaline-heavy event. If you haven’t bow-killed a deer on the ground, just know that getting into a situation where a shot opportunity could unfold will likely be half your battle. Sure, you might unexpectedly encounter deer while hiking to your treestand, but to head out and strictly hunt on the ground is another matter entirely. It goes without saying that whitetails have keen senses with the ability to determine when something is amiss, making this hunting style very challenging, but certainly shy of impossible. Whether you’ve never bow-killed a deer from the ground or you’ve had little success, there are several ways to increase your chances for an in-your-face encounter. Let’s review. I believe the number one reason few folks are deadly on whitetails while hunting from the ground is that most bowhunters fear leaving their comfort zone. I mean, treestands arguably provide advantages — they put you above the whitetail’s general field of view, and in some cases, they provide greater shooting coverage of the area. So why hunt on the ground and make killing a deer more difficult than it already is? To that point, I pose a second question: Ever wonder what’s happening in other locations when your treestand is void of action? I wonder constantly. And that curiosity has caused me to spend more time toting my bow on the ground. The group of whitetail fanatics who produce Whitetail Adrenaline hunt exclusively from the ground, and I’ve spent a few years now picking Jared Scheffler’s brain on how he and his crew annually arrow impressive – even huge – bucks at eye level. Mind you, the crew hunts exclusively on public land, and Scheffler himself uses a longbow. Talk about stacking challenges on top of challenges. Each time I visit with Scheffler, I can’t help but wonder if he and his crew would have the number of outstanding bucks to their credit that they do had they continued hunting from treestands. It’s worth pondering. To conclude this section, let me state the obvious: You won’t bow-kill deer on the ground if you don’t try. Nothing replaces experience. Successes and failures are all part of mastering the art of hunting on the ground. Spend as much time as possible hunting from the ground each fall, and always have the mentality that you will learn something new every time you enter the woods. It’s important to note that when you hunt on the ground, you will make mistakes. That is nothing to be ashamed of. In fact, it’s completely normal. However, you must be attentive to every detail. Determine what went wrong and why the outcome unfolded how it did. Whether you blew deer out well before you saw them or simply whiffed a shot opportunity, it’s imperative you learn from mistakes and work to avoid them next time. When most folks think about bowhunting deer from the ground, makeshift or pop-up blinds naturally come to mind. However, the style the Whitetail Adrenaline crew uses most involves tons of flexibility and mobility. “We don’t like to get hung up in unproductive spots,” Scheffler shared. “Since we exclusively hunt on public land, we sort through lots of acreage to find truly productive spots. When we spot deer or sense that something is about to happen, we put on the brakes and get ready. “One example is my 2014 Iowa hunt,” Scheffler continued. “My cameraman and I covered 30 miles in five days. Most of the ground we saw wasn’t worth our time. On the final morning, we encountered three bucks that would’ve scored 160-175. I didn’t kill one, but we’d located a productive pocket using our aggressive ‘sorting’ approach. 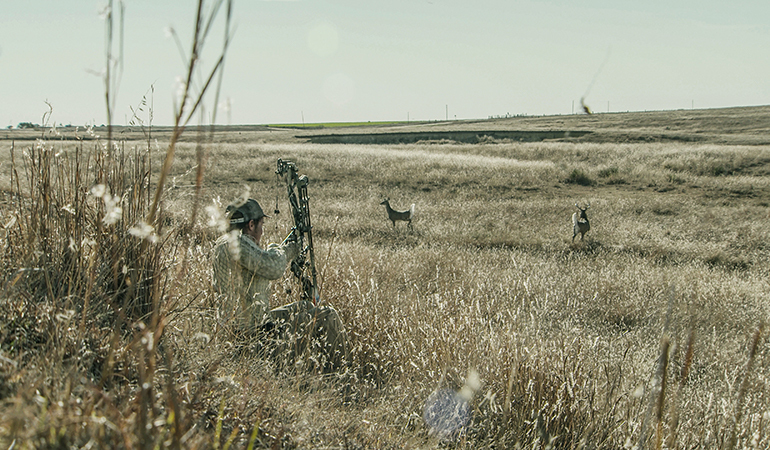 Folks who hunt in small patches of timber on the expansive plains commonly watch bucks court does in the wide open. And unless the doe pulls the buck to your stand location, the encounter doesn’t become a shot opportunity. However, a ground hunter can make a play in many of these cases. It’s best if the buck and doe are bedded, in which case you can crawl within bow range and hopefully get your shot without ever alerting the buck to your presence. However, terrain and cover might be sparse, allowing you to only get so close. In this case, a buck decoy can be your ticket to the show. The goal is to get within the buck’s comfort zone and then impose a threat by deploying the decoy and grunting or snort-wheezing. This is a very natural scenario that unfolds all the time in the wild — a buck is in lockdown with a hot doe, and subordinate bucks are circling and looking for a way in. Now, there are two possible outcomes. It’s either fight or flight. In option A, the buck will typically approach stiff-legged with ears laid back. He’ll many times approach head-on, which is a shot that can be ethically made, but only at top-pin range and if you’ve studied anatomy charts and have practiced the shot. The buck could instead circle the decoy trying to acquire the downwind advantage, which could equal a broadside shot. In any case, those pesky open-country bruisers become huntable if you leave the treestand and grab a decoy. One note of caution: When using a decoy, you always must be totally aware of your surroundings. Don’t use one if firearm seasons are running concurrently with archery season. Also, use caution when roads are in view. Unfortunately, poachers exist. You must always expect the worst that can happen. Never use decoys in situations where safety is risked. Lastly, try not to get tunnel vision when that adrenaline surges through your veins as you look into the eyes of your prey. It can be intimidating and nerve-rattling, but the focused bowhunter who is aware of his surroundings will act methodically and close the deal with a well-placed arrow. And when that bowhunter is you, it’ll likely be the wildest success story you’ve ever told your friends and family.